The 1926 hurricane put an untimely end to the Roaring Twenties in South Florida. Whatever remained of the real estate boom came to an abrupt halt on September 19,1926, when the monster storm ravaged the lower end of the peninsula. Although South Florida rallied quickly, it may have been plunged into a de­pression a good three years before the rest of the country. Prohibition, however, was not allowed to dampen the spirits of the boom or the bust. Many South Floridians frequented speakeasies and took up bootlegging. Rumrunners bought liquor in Bimini, Bahamas, which they easily smuggled into South Florida. Tourism was encouraged during the lean years by legal and illegal gambling. Most local officials turned a blind eye to these activities. Al Capone moved to Miami in 1928 and these somewhat innocuous forms of entertainment suddenly assumed a more sinister character. Also in 1928, a local institution in Broward County, Cap’s Place, was established. Originally known as Club Unique, the restaurant was a popular supper club and gambling ca­sino in the 1930s and 1940s. Cap’s Place was owned by Captain Theodore Knight, one of the earliest settlers in the Lighthouse Point area and a colorful character in Broward County’s history. Eugene Theodore “Cap” Knight was born in 1871 in Cape Canaveral, Florida, either inside or very near the Canaveral Lighthouse. He was descended from a family of seamen. His grandfather was Captain Mills Olcott Burnham, a Vermont Yankee who transferred in 1837 from the Federal Arsenal in Watervliet, New York to the Arsenal of the South, near Jacksonville. Duval County had just been organized and Burnham, a powerful man, served as the first sheriff of the county. In 1853 Burnham became keeper of the Canaveral Lighthouse and later served in the Florida State Legislature. Cap’s father, Captain J.A. Knight also served as keeper of the Canaveral light beginning in the early 1870s until his death in 1892. Lured by the call of the sea, Cap ran away from home when he was 13 years old and worked as a messboy on a lighthouse tender. He worked his way up to mate and eventually to Master of Morgan Line Steamers which sailed between New Orleans and New York. By the time Cap retired, he had been at sea for more than thirty-five years. Cap’s younger brother, Thomas, was born in 1879 and followed in his father’s and grandfather’s foot­steps. At the age of eighteen, Tom became assistant keeper of the Canaveral Lighthouse, a position he held for eight or nine years. Subsequently, Tom transferred to Jupiter where he served as keeper of the Jupiter Inlet Lighthouse, which had been erected four years earlier. Reportedly Tom would signal Cap as he passed by in the night on a steamship. Cap’s first marriage was to Bertha Lydia Armour, the daughter of James Arango Armour, keeper of the Jupiter Lighthouse from 1866-1906. The marriage produced three children but ended in divorce some­time prior to 1914. In 1916 Cap married Lola Saunders, originally from Cross Creek, near Ocala National Forest. Shortly after completing high school Lola secured a contract to teach the children of lighthouse employees and fishermen at the Hillsboro Inlet. One of the first teachers in the area, Lola conducted classes in the Coast Guard Station next to the lighthouse. With the advent of Prohibition in 1919, Cap and Lola became involved in the profitable business of rum running. Cap picked up whiskey in Bimini, a tiny island in the Bahamas about 50 miles from Florida, and brought it back to his base near the Hillsboro Inlet. This location was ideal because of its isolation, easy access to the Atlantic Ocean, and protection by heavy vegetative growth. The powerful Hillsboro Light served as a beacon during the dark nights when Cap made his trips from Bimini. Cap’s liquor runs were always successful and he never got caught. He was a skilled navigator, had faster boats than the Coast Guard and several area residents suggest that his brother flashed warnings from the lighthouse when the coast was clear. . . .Scared? We were never scared. I’m not afraid of the devil himself, and neither was Cap. By 1926 Cap decided to settle near Tom at the Hillsboro Inlet. 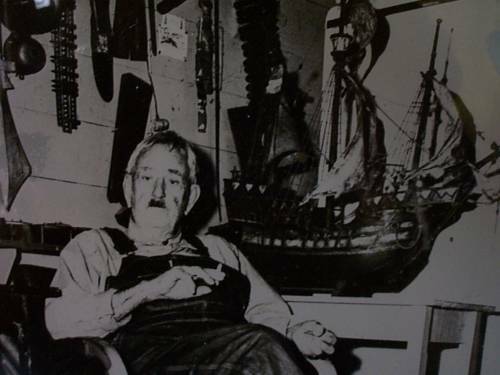 He built a small store on a spit of land in Wahoo Bay just opposite the lighthouse. Around that time Cap met a young man from Pittsburgh, Pennsylvania, Albert Hasis, age 16, who had also run away from home and come to Florida to seek his fortune. Cap and Al quickly became friends. A father-son relationship developed that endured the rest of their lives. The 1926 and 1928 hurricanes caused severe damage to the area and convinced Cap that his location at the inlet was too vulnerable. In 1928 he moved inland approximately half a mile to the present site on a peninsula bordered by the Intracoastal Waterway on the east and Lake Placid on the west. Cap bought a barge in Miami for about $100 which reportedly was used by Flagler during the construction of the Overseas Railroad to Key West. With Al’s help Cap beached the barge by floating it ashore on a high tide. The barge was stripped of its iron fittings and the cabin and machinery were re­moved and sold as scrap. 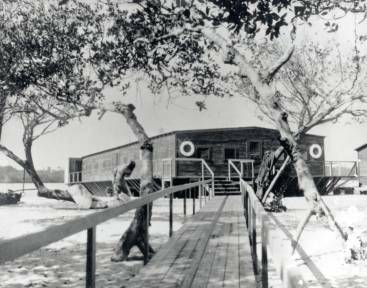 Dade County pine from the newly opened Pompano Lumber Company was used to build an enclosed structure on top of the barge. By 1929 Club Unique was open for business. The restaurant was an immediate success and lived up to its name in several ways. One reason for its popularity was the delicious and unusual food. Club Unique offered the freshest seafood: all types of fish, crab, lobster, grouper chowder, and green turtle steak. A specialty of the house, hearts of palm salad, was made from Sabal Palm trees imported from the Ever­glades around Lake Okeechobee. Turtle egg pancakes were served with guava jelly, and homemade seagrape jelly accompanied hot rolls. In addition to an outstanding menu, Club Unique offered guests the added attraction of gambling, which was illegal in Florida at the time. Private memberships to the “supper club” were sold for twenty-five cents. Slot machines lined the hallway between the dining rooms and kitchen. 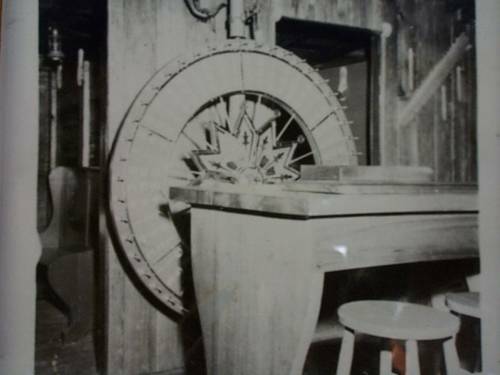 A Wheel of Fortune hung in the bar, complete with curtained alcoves for private dining. Other games of chance included blackjack, dice games, chemin de fer tables and a roulette wheel. During the 1930s, gambling interests who controlled the action told Cap to “spruce up the place.” Cap laid red carpeting in the front dining room and it Room. The money counting room was located at the south end of the Poinsettia Room with a private exit to the east. Although insects are often troublesome in South Florida, screens were seldom used. Windows were covered, however, the dark cloth to keep out prying eyes. Another reason for Club Unique’s popularity was its remote location and rustic atmosphere. Originally the restaurant was accessible only by water. Until 1953 the main entrance to the res­taurant was from Hillsboro Beach, to the east across the Intracoastal. Guests flashed their car lights to signal an employee who paddled a rowboat across the waterway and transported them back to the restaurant. 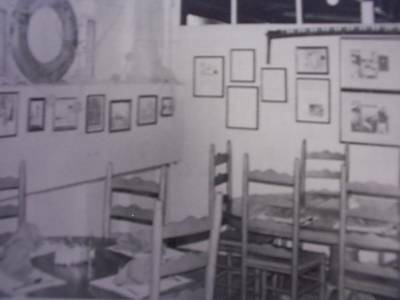 Once guests arrived at the island retreat, they were ushered into dining rooms filled with souvenirs and artifacts collected by Cap. Fishnets served as curtains and parts of ships, rope, driftwood and harpoons hung haphaz­ardly from the ceilings. The walls were lined with shark jaws, rattlesnake skins, and Cap’s collections of mugs and coins. 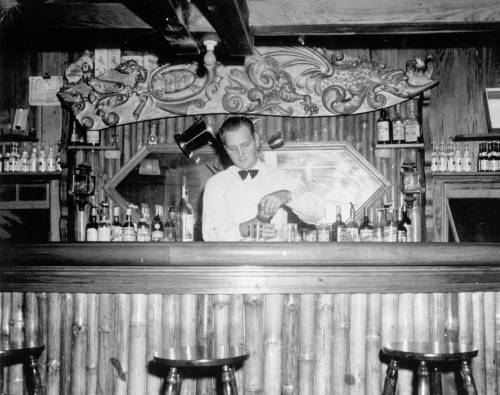 Al built the bar, made of bamboo from the Everglades and polished wood from the decks of ships. The bar is dominated by a large, carved wooden bow-sprit from a Spanish galleon, and other curios scavenged from the sea. As much a part of the original decor as the wooden bow-sprit, Chef Sylvester Love came to Cap’s Place in 1940. He began as a dishwasher and worked his way up to chef. Cap taught him the “special way” of Knight cooking and each meal was always prepared to order. Perhaps the most famous visitors to Cap’s Place arrived in January, 1942. Prime Minister Winston Churchill and President Franklin D. Roosevelt held a series of secret war conferences at the Hillsboro Beach estate of then Secretary of State Edward R. Stettinius. Among those attending the strategy sessions were General George Marshall, Lord Beaverbrook, Admiral William “Bull” Halsey and other high officials. The Stettinius Villa was located across the Intracoastal, on the ocean side, just a short walk from Cap’s boat landing. Cap was asked to cater food and deliver groceries to the dignitaries. On one occasion, Churchill and Roosevelt dined at Cap’s Place. Captain Bruce Bennet supervised the logistics of transporting Churchill, Roosevelt (and his wheelchair), and the rest of the entourage in a boat to the restaurant. Bennet’s greatest fear was overloading the boat or tipping it over. The guests dined in the “yellow room” and enjoyed a meal cooked by Sylvester and served by Cap in his bib overalls and denim shirt. No doubt Cap offered Roosevelt and Churchill a refreshing change from the stress of a world at war. Cap’s Place was popular with local residents and tourists alike. Among the celebrities who dined there were artists, sports figures, movie stars and socially prominent people. A partial list includes: Joe DiMag­gio, Susan Hayward, Casey Stengel, Jack Dempsey, James Montgomery Flagg, Kate Smith, Myrna Loy, George Jessel, George Harrison and the Vanderbilt Family. Among the many guests during 1945 was a young woman named Patricia McBride, on vacation from Minneapolis. Pat met and fell in love with Al Hasis and within weeks they were married. Al and Pat made their home in one of several cottages built by William Kester, a wealthy real estate developer. They both took jobs at Cap’s, which marked the begin­ning of a lifelong involvement with the restaurant. Cap and Lola built a house on stilts over the water, which is now a boathouse, and called it home for more than thirty years. Cap had other business interests besides the restau­rant. He ran a fleet of commercial fishing boats which handled an estimated half a million pounds of fish a year. 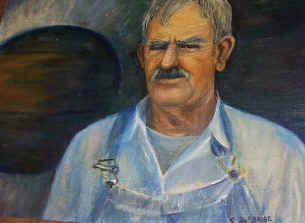 Cap owned a wholesale fish market in Pompano and managed a fish camp in the Everglades until the late 1940s. During the next decade Cap’s Place began to feel the effects of political and developmental pressures. Gambling continued to be popular throughout the 1940s, reaching a high point during “the Hot Money Winter of 1946-47.” However, a congressional inves­tigation of illegal activities in Florida caused Senator Estes Kefauver to “put the clamp on casinos” in 1951. This action put an end to the weekly visits of mobster Meyer Lansky and his men to collect their percentage of the winnings at Cap’s Place. In 1956 the area’s 107 residents voted to incorporate as a town. The town became the City of Lighthouse Point in 1957, fifty years after the founding of the Hillsboro Lighthouse. When the second section of the city was platted in 1953, Cap Knight Bayou was officially labeled on the map. Cap’s name made the newspapers in 1962 when he was arrested and charged with possession of illegal turtle eggs. According to the Ft. Lauderdale News, “the law stormed ashore at Cap’s Place and conservation agents raided the restaurant where they uncovered 240 turtle eggs,” used in the making of . pancakes. Although turtles were listed as an endangered species, Lola Knight told reporters that Cap had been serving them for 36 years. Cap was released on $100 bond and “gave his word” to the agents that he would not buy turtle eggs again. Cap died in l964 at the age of ninety three and is buried in the Pompano Beach Cemetery. Lola, Pat and Al continued operating the restaurant and the Hasis Family eventually as­sumed ownership. Lola retired in the mid 1970s and moved to Palatka, but maintained an interest in the restaurant until her death in January, 1989. Cap’s Place has a personality all its own. It has stood through the pioneer days, Roaring Twenties, Prohibition, the Depression, world wars, and times of peace. Cap’s Place echoes the voices of the many celebrities and local folks who have dined there. Even the buildings represent early settlers’ ingenuity in adapting to the climate with locally available materials. Known as Vernacular architecture, this style relies on the builder’s experience to create a useful and practical building. Cap Knight was a practical man who played an important role in the area’s history. Described by historian Wesley Stout as an “outstanding character of Broward County,” Presently Cap’s Place is owned and operated by the children of Al and Pat Hasis, Tom, Ted and Talle. They strive to maintain the same quality that has made Cap’s such a success through the years. The Lighthouse Point area has been extensively developed, but fortunately the ambience surrounding the restaurant remains much the same as it was seventy years ago, when Pompano was just a whistle stop on Flagler’s railroad.